Background: Although plate-and-screw fixation provides strong support for the surgical treatment of bone fractures, bone reconstruction involving autologous bone or implanted bone substitute materials are promising treatment methods for the repair of large bone defects in areas of poor soft tissues. However, harvesting autologous bone requires invasion and can be associated with donor site morbidity, whereas artificial bone has poor osteoinductive properties and insufficient strength for use in loaded sites. Regenos® is an interconnected porous hydroxyapatite bone substitute that promotes cell penetration and bone formation within the material when implanted into bone defects. This bone substitute also provides strength against loading due to its unidirectional porous structure. Here, we evaluated the potential of Regenos® to repair intra-articular calcaneal fractures. Methods: In this retrospective study, open reduction of intra-articular calcaneal fractures using Regenos® cubes was evaluated in 4 males (aged 48-73 years). The calcaneal fractures consisted of three joint-depression types and one tongue-type based on Essex-Lopresti classification. The fractures were approached using a single lateral incision and the fractures were reduced under fluoroscopy. The reduction was held with a Kirschner wire (KW) and Steinmann pin (SP) and the bone defects were then filled with Regenos® cubes without plate fixation. All wires and pins were removed four to six weeks after the operation, and partial loading was permitted as part of the postoperative management using a heel brace. Full load bearing was allowed 10 to 12 weeks after the operation. Two-year follow up was obtained for clinical and radiologic outcomes. 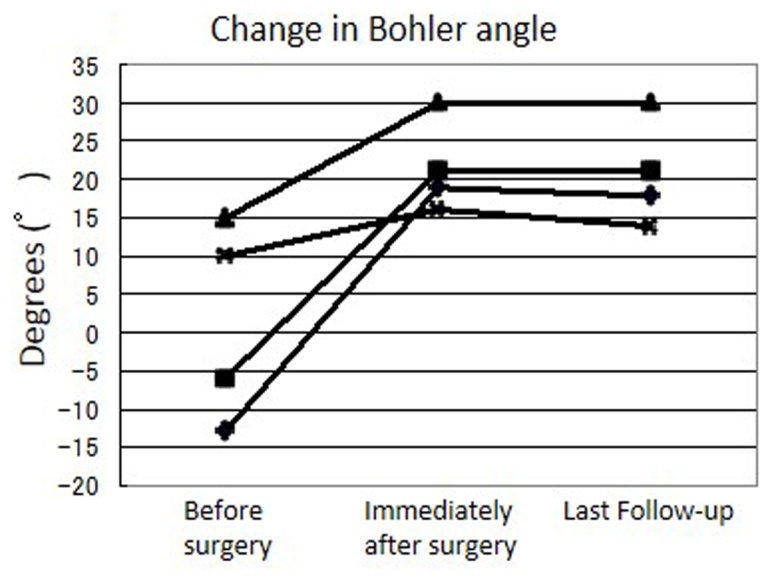 Results: Bohler’s angle improved from an average of 1.5 degrees before surgery to 21.5 degrees after surgery, and remained at 20.8 degrees at the time of final evaluation. None of the implanted Regenos® cubes dislocated or collapsed during the evaluation period, and no complications or loss of correction were observed. After 12 weeks, the implants incorporated with the surrounding bone and trabecular bones were reconstructed. Conclusion: The present clinical findings suggest that Regenos® is useful as a bone graft substitute for filling intra-articular calcaneal fractures treated by open reduction. In the treatment of intra-articular calcaneal and tibial plateau fractures, bone defects often remain after fracture reduction, which is typically fixated with plate-and-screw fixation. Although this approach provides strong support, plate fixation is associated with several complications, including infection, revision surgery, hardware failure, and nerve damage. In addition, autologous bone grafting is often required to retain the articular surface after surgery. 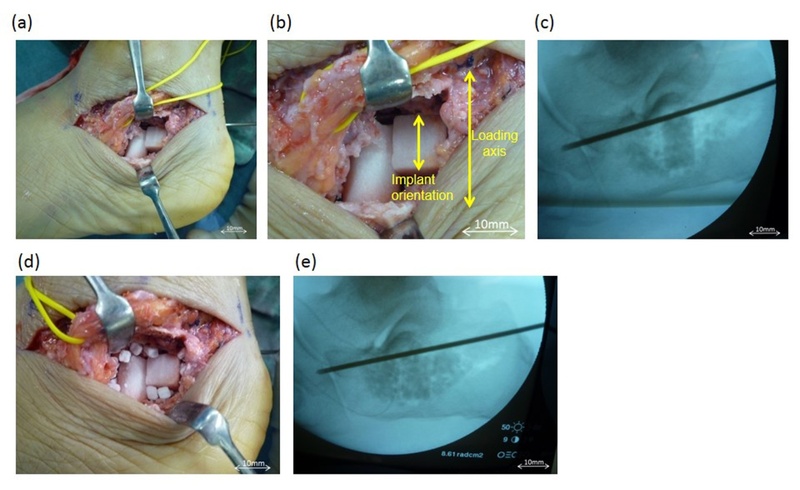 The implantation of artificial bone grafts combined with internal fixation has the potential to avoid the possible complications of plate fixation, and may also improve bone strength and clinical outcomes . Materials such as autologous bone, hydroxyapatite (HAp), β-tricalcium phosphate (β-TCP), and calcium phosphate cement (CPC) are commonly used as bone graft materials for filling bone defects. Despite the advantages of artificial materials over autologous bone, patients may suffer from complications such as infection and loss of reduction due to poor osteoconduction and inconsistent incorporation. However, we recently developed a unidirectional, interconnected porous HAp material (Regenos®; Kuraray Co., Ltd.) that promotes the rapid penetration of body fluid and cells into the material through capillary action (Figure 1) . As osteogenic cells easily penetrate into this bone substitute material, bone regeneration and angiogenesis rapidly occur within the implant . We anticipated that the combination of Regenos® implants with fixation through either a Steinmann pin (SP) or Kirschner wire (KW) would promote long-term fracture healing. In the present study, we retrospectively examined the effectiveness of Regenos® as a bone graft substitute for filling the void space of intra-articular calcaneal fractures during fracture reduction. The medical records of patients who underwent surgical treatment for intra-articular calcaneal fractures at our hospital between December 2010 and June 2011 were retrospectively surveyed and followed-up postoperatively for at least 24 months. The following items were analyzed: age, gender, follow-up duration, fracture type, internal fixation material, and amount of Regenos® used. Bohler’s angle and horizontal diameter ratio of the calcaneus were evaluated using simple X-ray images. Step-off of the posterior talocalcaneal joint surface and the time-course changes of the Regenos® implants were evaluated using computed tomography (CT) images. Time-course changes in the defect area were monitored for 24 to 30 months. Figure 1 Computed tomography image of a cross-section of Regenos® synthetic bone substitute (Kuraray Co., Ltd.). Patients were evaluated clinically using the Creighton-Nebraska Health Foundation (CNHF) assessment score  and fractures were classified as excellent (90 to 100 points), good (80 to 89 points), fair (65 to 79 points), or poor (less than 65 points) (Table 1). Four male subjects between the ages of 48 and 73 years with intra-articular calcaneal fractures were included in the study. X-ray and CT scans revealed that the fractures consisted of 3 joint-depression type and 1 tongue type by the Essex-Lopresti classification , and two Type 2A and two Type 3AB fractures according to the Sanders classification . Surgeries were performed in the decubitus position on the affected side. To access the fracture, the subcutaneous layer at the incision site was moved to allow access to the outer wall of the calcaneus fracture, and the dislocated posterior talocalcaneal joint surface was repositioned. The fracture was fixed from the posterior and distal calcaneus surface using a KW in three patients and a SP in one patient. Table 1 Characteristics and implant information of the four cases of intra-articular calcaneal fracture. Figure 2 Intra-operative images of a calcaneal fracture repaired using a Regenos® implant. (a) Bone defect after being filled with an implanted Regenos® cube. (b) The implanted cube was oriented parallel to the loading axis. (c) Intra-operative fluoroscopy image taken after the main cube (cylinder type) and some granules were used to fill the defect space after reduction. (d) Regenos® cubes and granules were used to fill the defect space after reduction. (e) Intra-operative fluoroscopy image taken after Regenos® cubes and granules were used to fill the defect space after reduction. 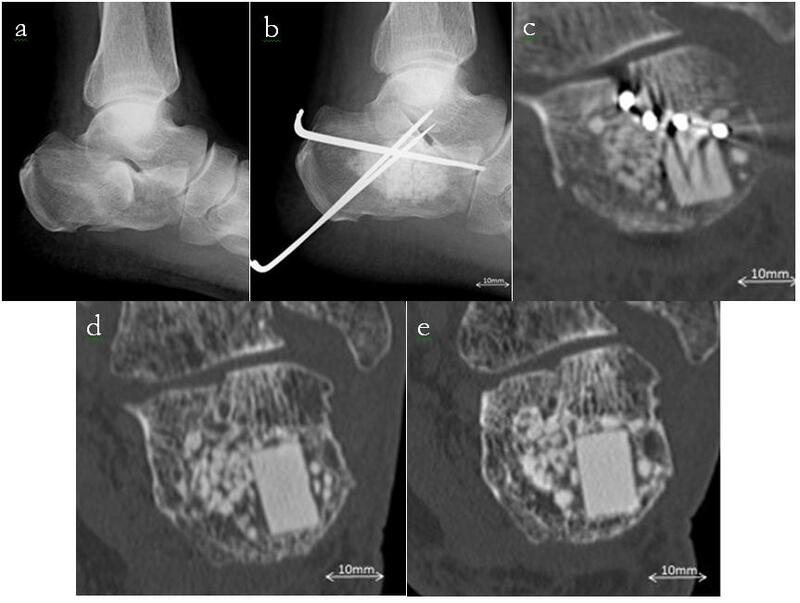 Figure 3 Time course of changes in the Bohler’s angle (a), calcaneus horizontal diameter ratio (b), and step off of the posterior talocalcaneal joint surface before, immediately, and at the time of last follow-up (24-30 months). The data was obtained from plain x-ray and CT images. The bone defect which formed after anatomical surface reduction was then filled with Regenos® cubes (10x10x10 mm or 7x7x7 mm). The implanted cubes were placed in the bone so that the direction of the pores was parallel with the load axis. The gaps that remained after implanting the cubes were filled with Regenos® granules (Figure 2). To prevent protrusion of the outer wall of the calcaneus, a fixation staple and cancellous screw were used in one patient. Six weeks after surgery the KW and SP were removed and partial loading was started as postoperative therapy. Full weight bearing was permitted 12 weeks after surgery. Training for active range of motion of the ankle was started in the first week of the postoperative period. At the time of final evaluation (24 to 30 months), the average CNHF score was 92.8 points (range, 88 to 95 points), and treatment outcome was excellent for 3 patients and good for 1 patient (Table 1). Time course changes in the following parameters were determined from x-ray and CT images (before surgery/after surgery/final evaluation): Bohler’s angle (average): 1.5 degrees/21.5 degrees/20.8 degrees; calcaneus horizontal diameter ratio (average): 1.29/1.13/1.11; and maximum step-off value of the posterior talocalcaneal joint surface in CT (average): 5.9 mm/2.2 mm/2.3 mm (Figure 3). The contour of the Regenos® cubes in x-ray images was obscured approximately two weeks after surgery. By 6 to 8 weeks after surgery, the implanted cubes appeared denser, indicating that new bone had begun to form within the implanted material. None of the implants were dislocated or crushed during the follow-up period. To evaluate the effectiveness of Regenos® in intra-articular calcaneal fractures, we examined one case in greater detail (Figure 4). The patient was a 72-year-old man who suffered an intra-articular calcaneal fracture after a 1.5-m fall from a stepladder. The fracture was a tongue type in the Essex-Lopresti classification and Type3AB in the Sanders classification. The preoperative Bohler’s angle was -13 degrees, calcaneus horizontal diameter ratio was 1.4, and posterior talocalcaneal joint step off was 3.9 mm. Surgery was performed on day 11 after the injury. Figure 4 Images of the fracture site before and after surgery for a representative patient. Plain x-ray images at the time of injury (a) and after surgery (b). CT (MPR) images just after surgery (c), 3 months after surgery (d), and 6 months after surgery (e). Three KWs (2.0-mm diameter) were used for internal fixation. The bone implants consisted of one cylinder type (11 mm x 20 mm), 1 cube type (10x10x10 mm), and 4g of granules. No complications were reported in the postoperative period, and wires were removed six weeks after the surgery. The CNHF score at the final evaluation was 95 points (excellent). During the follow-up period, no correction loss was observed in the x-ray or CT images. 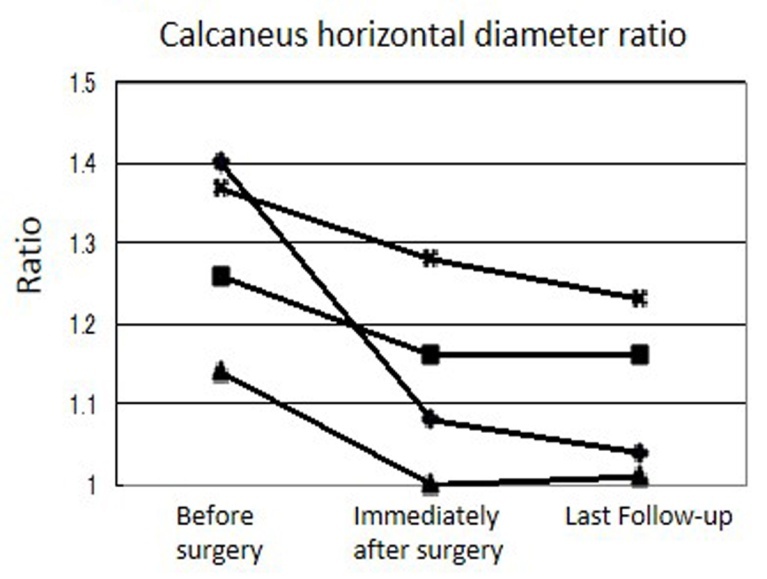 At the time of final evaluation (30 months), the Bohler’s angle was 19 degrees, calcaneus horizontal diameter ratio was 1.08, and posterior talocalcaneal joint step off was 3.0 mm. In an x-ray image of the defect site taken two weeks after surgery, the outline of the Regenos® implants was unclear. The margin of the bone implant became obscure at 6 weeks after surgery, and the implant appeared denser at 8 weeks post-surgery. The contour of individual granules could not be distinguished at 9 weeks after surgery. These findings were confirmed in the CT images. In addition, osteogenesis had occurred in the areas surrounding the granules. After removal of the wires, the bone defect could not be clearly distinguished from the surrounding bone by 6 months after the surgery, and osteogenesis had clearly advanced. During the treatment course, no damage to the cylinder or cube-shaped implants was detected. The use of synthetic bone materials for the repair of large bone defects, such as those that often occur as a result of intra-articular calcaneal fractures, presents a promising treatment option. In four cases, we demonstrated that the interconnected porous HAp bone substitute Regenos® functioned as an effective bone graft substitute for intra-articular calcaneal fracture which contributed to favorable treatment outcomes. At the time of final evaluation (24-30 months), the implanted Regenos® cubes had fused with the surrounding bones, and the trabecular bones were successfully reconstructed. None of the implants dislocated or collapsed during the evaluation period, and no correction loss or complications, such as infection or nerve damage, were observed. Our clinical findings suggest that Regenos® is a promising bone graft substitute material for intra-articular calcaneal fractures treated by open reduction. The Regenos® bone implants used in this study were composed of unidirectional HAp of 99.9% purity and 75% porosity. Regenos® is manufactured using a template consisting of ice columns, which leads to the formation of unidirectional oval pores with major and minor axes of approximately 300 and 100 μm, respectively . The compressive strength of this material in the direction of pores is approximately 13 MPa, which is higher than that of conventional HAp with similar porosity . 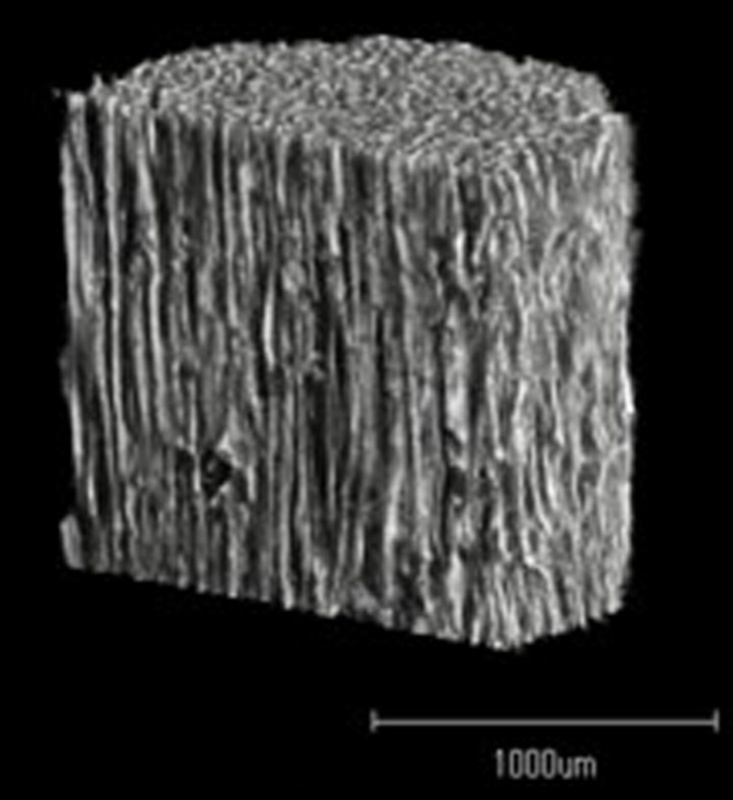 As new bone is formed within the unidirectional pores, the compressive strength of the material increases, reaching 3.4 times of the initial strength after 12 weeks in animal models . Because blood vessels and bone marrow-like tissue are generated within the implant material, newly formed bone undergoes remodeling and is maintained . Karageorgiou et al  reported that pore sizes of 100 to 300 μm are suitable for promoting angiogenesis and osteoconductivity. Iwashashi et al  histopathologically investigated the new bone formed inside Regenos® bone implants that had been transplanted into bone defects in rabbit tibia and observed bone formation as early as 2 weeks, with the bone formation rate ranging from 33% to 55% at 6 weeks post-implantation. Due to these properties, Regenos® bone implants were evaluated for their potential to repair large intra-articular calcaneal fractures. As conventional HAp is highly stable in vivo, bone reconstruction in response to mechanical stimulation does not typically occur in bone defects filled with HAp. Therefore, bone at defect sites repaired with HAp implants is fragile and prone to fracture . However, because Regenos® contains suitable pore sizes and porosity for promoting bone conduction , new bone formation can be expected within the material upon implantation. In the present study, the continuity of Regenos® with the bone surrounding fracture sites was first observed in x-ray images approximately 6 weeks after surgery, and consolidation with the surrounding bone was confirmed 3 months after surgery in CT images. Watanabe et al  also reported that good bone formation occurred in bone defects created in the lower portion of a dog hind limb following transplantation of Regenos® cubes that were fixed in combination with a metal plate. Although the interconnected porous structure of Regenos® imparts a compressive strength comparable to that of cancellous bone, this bone graft substitute does not permit immediate loading after reparative surgery. However, our present findings demonstrate that this synthetic bone substitute has sufficient initial strength for repairing defects in the loaded portion of bone, if the load is minimized for the first few weeks post operatively. Although plate fixation is often used to treat calcaneal fractures, this approach has several disadvantages, including an increased potential for skin necrosis, infection, and sural nerve damage, inflammation of the peroneal tendons, and necessity for a recovery period with no weightbearing . In the treatment procedure used here, four calcaneal fractures were reduced and filled with Regenos® bone substitute. Using this approach, the opened area was smaller than that needed for plate fixation procedures, thereby decreasing the risk of post-surgery complications, such as skin necrosis. Notably, filling the bone defects with a bone substitute supported the reduction position, which was maintained by KW and SP. The use of Regenos® was also advantageous because the pins could be removed less invasively compared to plate and screw fixation. Several factors may explain why the present treatment outcomes were similar to those typically observed for bone defects repaired by plate fixation. In particular, long-term stabilization of the defect site was achieved due to autologous bone formation within the Regenos® implants. In addition, the unidirectional porous structure of Regenos® provides support in the load direction, and Regenos® granules were also used in combination with the cube to fill the defect site, which would provide further mechanical support. The approach described here for filling large bone defects is expected to provide performance equivalent to plate fixation with respect to the acquisition and retention of an anatomically reduced position, and is considered to be safer due to a reduced risk of complications. Further, filling bone defects after open reduction helps prevent correction loss. 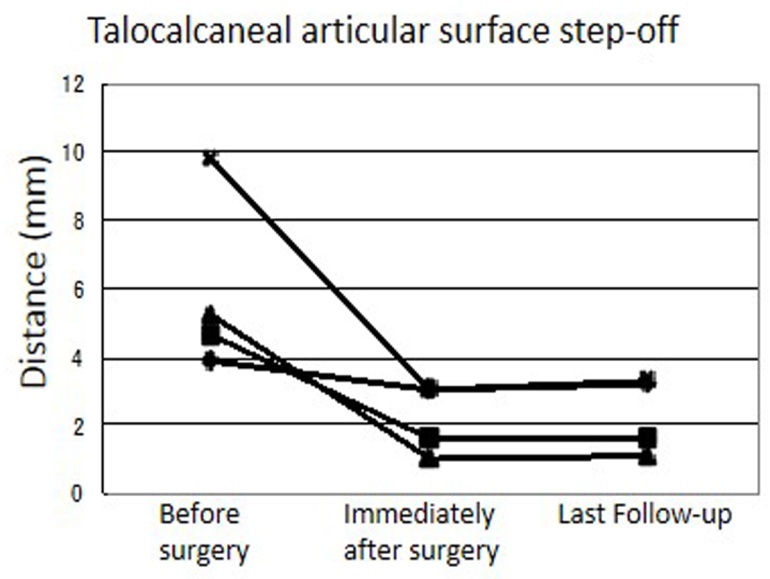 Combining bone grafting with pin fixation was useful for suppressing posterior talocalcaneal articular surface dislocation and Bohler’s angle decline by avoiding postsurgical correction loss. In addition, this treatment strategy permitted post-surgical weight bearing and ankle joint motion training to be started within 4 to 6 weeks, which may help prevent joint contracture and bone atrophy. Based on the amount of Regenos® material required in each of the present surgeries, relatively large bone defects were formed after the reduction operation. The two fractures classified as Type3AB in the Sanders classification tended to require more Regenos® material to fill the bone defect (Table 1). These findings suggest that fracture severity and bone defect size after reduction operation are correlated. In the early postoperative period following bone defect repair, during which compressive strength and bone formation increases, the use of Regenos® as a bone graft substitute is expected to overcome the limitations of commonly used bone graft substitutes. For example, in the case of ß-TCP, the compressive strength of the implanted bone is lower than that of the material alone until 3 to 24 weeks after transplantation . In addition, decreased volume and damage to bone graft substitutes have been reported for HAp and CPC after long-term use . Our present findings indicate that Regenos® is an excellent bone graft substitute in calcaneus fracture surgery. Regenos® cubes and granules were used to repair bone defects formed after open reduction without plates for the treatment of intra-articular calcaneal fracture. The patients’ postoperative recoveries were excellent, and fusion of the Regenos® with the surrounding bone and reconstruction of trabecular bone were confirmed. Our present clinical findings indicate that Regenos® is a useful bone graft substitute material for filling large bone defects formed after intra-articular calcaneal fracture and for the positioning of fractures during open reduction.